Remember the days where you would schedule a doctor’s appointment only to get there and wait for a couple of hours? If you had any tests done, it would take days to get results back and often you’d have to go back to the office and wait all over again? Thankfully that’s a bygone era. Driven by the need for a better customer experience healthcare is experiencing a huge shift. And just like other industries, the digital transformation trends in healthcare aren’t slowing down in 2019. As a preview to CES, we’ve already learned about a virtual caregiver named Addison that may soon help support the 10,000+ aging Americans who turn 65 every single day. With the help of AI, she’s able to monitor a person’s health and even recognize signs of decline—allowing older Americans to age in their homes safely while also making up for the insufficient number of caregiving humans in many communities. Addison, like many of today’s top digital transformation trends in healthcare, are good for both patients and the larger healthcare industry. And they’re only getting better as we head into 2019. Indeed, digital transformation has revolutionized every industry, but in healthcare specifically, technology is helping us live longer and lead more safer, healthier, productive lives. The impact of these top five digital transformation trends in healthcare could save lives for decades to come. In 2015, there were just over 1 million telehealth patients. By 2018, that number rose to 7 million—and for good reason. Today’s telehealth technology is empowering patients in even the most remote locations of the world to access quality healthcare and receive life-saving diagnoses. Can’t afford to fly across the country to meet the top cancer specialist? It doesn’t matter. That specialist can connect with your local doctor digitally so you never miss a beat in your treatment. In a sense, telemedicine levels the playing field—geographically and financially—allowing anyone to access the best healthcare at any time. Similarly, it saves doctors the time and cost of traveling to see the patients in their own remote locations. It’s a win-win on either side. In fact, just last week a friend told me about coming down with a cold on Christmas, but she wasn’t able to get into the doctor or urgent care for a prescription. She downloaded an app, described her symptoms, spoke to a doctor over the phone and got a prescription that day. The whole process took a few hours, but she never had to leave the comfort of her home. This is one of the digital transformation trends in healthcare that will only continue to advance and be more pervasive this year. Have you ever gone in for a test, but had to wait for a week for the results? This is where technology is enabling a better customer experience. With AI, body scans and other services are being dramatically improved. 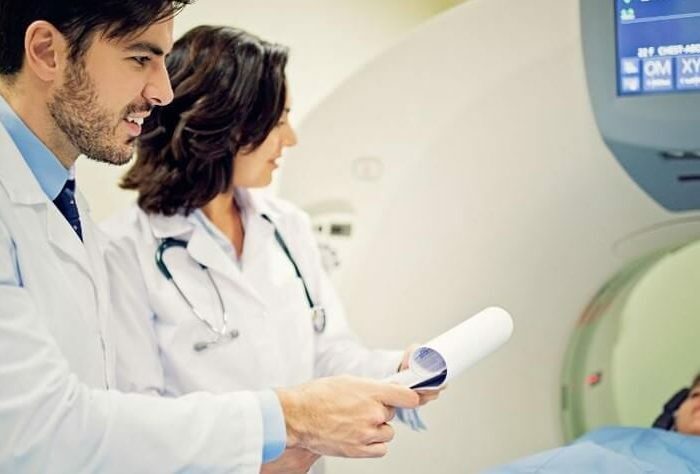 Using AI and deep learning, body scans have been shown to analyze CAT scans up to 150 times faster than human radiologists, detecting acute neurological events in just 1.2 seconds. Talk about an improved customer experience! No more stressed out waiting—just accurate, on-the-spot answers. AI can also help with things like determining the most effective pharmaceutical compositions—allowing for faster trials and better meds than ever before. Oh, and on the backside, AI can do all the things it does in other industries—reduce costs, prevent identity theft, improve processes, etc. If you’ve ever had to change doctors or visit a specialist, you know how frustrating it is to transfer your patient files. But with blockchain, that whole outdated process will finally be unnecessary, as it automatically provides the allowed doctors and specialists with a complete medical history so you can get the care you need. It could also help solve some important data protection and security issues, helping hospitals and insurance companies save money—and stress—in keeping patient records safe. Yes, we already know AR can help doctors learn how to perform dangerous procedures—such as heart surgery–without having to learn on human beings. That’s good for doctors and patients both. But the reason I add AR and VR to the list for 2019 is what it’s doing on a smaller scale. One by one, AR and VR has the ability to help Alzheimer’s and dementia patients retrieve memories and a sense of joy simply by returning them to a time, experience, or sound that was important to them in the past. If you’ve ever seen the impact something simple like a support dog can have on an Alzheimer’s patient—taking them back to their childhood or earlier years—you know this is huge in terms of patient experience and overall joy. That’s what digital transformation is all about. Digital twins are the bridge between the digital and physical world. They have been used with computer systems and industrial technology to create exact models of environments that are as dynamic as the physical environment itself. In the case of healthcare, a Digital Twin provides a safe environment where providers and manufacturers can test the impact of potential change on the performance of a healthcare procedure by experimenting on a virtual version of the system (person or device) that is fed by abundant data from the real system. This essentially allows healthcare providers to play “what if?” So, while this has historically used with non-living things, this method can be a machine or a process, or even a living body. With the advent of machine learning and AI, digital twins are growing more capable and sophisticated providing greater insights and improving healthcare procedures. This trend will continue to proliferate in 2019. OK, maybe it’s more like Top 4.5 digital transformation trends in healthcare. Realistically, wearables have been around for quite a while, and the collection of data via the IoT is not something new and earth-shattering in 2019. The thing that’s new is that as the trend of wearables continues to grow, the healthcare industry can use the data gathered in amazing ways, including most importantly preventative medicine. The data is being used for research to advance different medical fields. And with the help of the IoT, it’s even being used to prevent larger health epidemics all over the world. No, we don’t usually think of mind-blowing excitement when we think of healthcare. But digital transformation trends in healthcare truly are blowing my mind as we head into 2019 and consider—given the speed of its advancement—just how much more is possible.